Presenting the KittyCatS Haunted Collection 2018 - SpiderCatS KittyCatS! 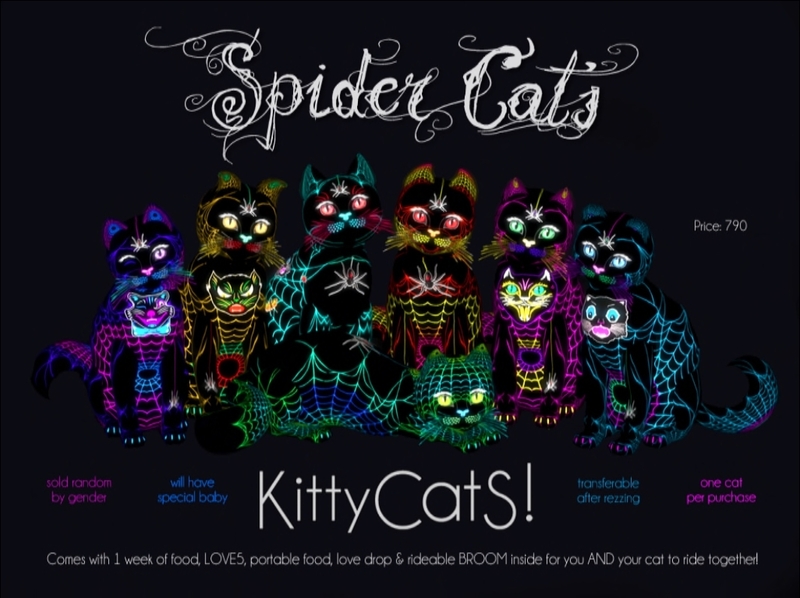 KittyCatS is proud to present our 2018 Haunted Collection - SpiderCatS collectible KittyCatS! Not quite superheroes, not quite scary. A little bit quirky and a whole lot of fun! The SpiderCatS hope they get you entangled in their charm and magical powers. Each one comes with a set of magical powers that will surprise you all throughout the year! Don't be fooled by their smiles or frowns! They won't do you any harm! And don't mind their glowing spiderwebs and colorful critters! These retro-future inspired kitties LOVE to be petted and cuddled! We hope you enjoy getting trapped by their charms! * are the KittyCatS SpiderCatS cats transferable? - yes, after you rez them! * can I buy more than one? - yes! * can I sell or trade them? - yes! * do they pass on their coats/eyes/tails/ears? -the SpiderCatS are a specially designed collectible cat with random Genesis KittyCat traits which have the potential to pass their hidden traits like any other Genesis KittyCat. They can carry the genes of the new traits and furs that can only be discovered through breeding. * can they breed something special? – yes! If you breed 2 SpiderCatS kitties they will give you a really lovely special baby you will NOT want to miss! ©2018 KittyCatS! all rights reserved. All names, titles, and text © KittyCatS! and may not be used without permission. RE: Presenting the KittyCatS Haunted Collection 2018 - SpiderCatS KittyCatS! Thank you very much KittyCats team for these new cats and this was something I think we all longed for for a long time. Not just getting new cats, but you have really striving to make these cats extra nice like the spider cats that are really nice and the height of creating art. Personally, i bought some of them to breed and then some to just save because they are so extremely nice. It was a long time ago since we got new cats, even though i personally prefer new cats a little more seldom than before. Previously, new cats came 4-5 times a year and i hardly had time to got a new recessive fur with nice traits, before it was time to hunting after the new ones. So, for my part, I'd rather see new cats only a couple of times a year. Am i the only one who have behavior how to thank Kittycats for their amazing work?